The United States is known for its national parks, which offer diverse and breathtaking landscapes. For many budget travelers, camping offers the most affordable and efficient way to visit the parks, but several parks also have hostels nearby. Staying in a hostel allows guests to enjoy the comforts of a bed and the social atmosphere that comes with staying in a hostel. 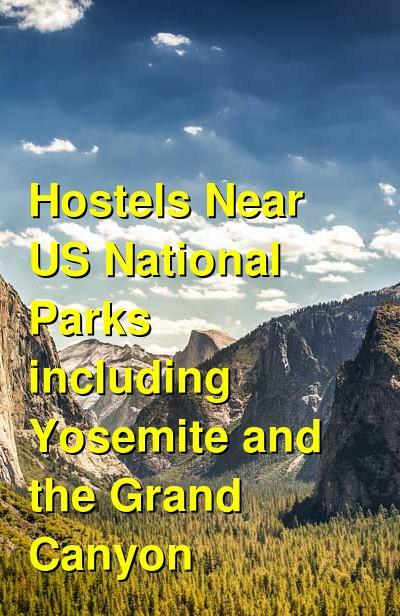 In particular, Yosemite National Park and Grand Canyon National Park both have hostels that are within a reasonable drive of their entrances. A hostel near Yosemite National Park that's good for solo travellers, backpackers, and groups. Yosemite Bug Rustic Mountain Resort is located about 25 miles from Yosemite Valley. It's located on a scenic 50 acre hillside lot and it has a social and relaxed vibe. The hostel has its own on-site restaurant that uses fresh and local ingredients. They have a wide variety of dishes available with everything from steaks to vegan options. There's also a shared kitchen available to guests where they can prepare their own meals. The hostel staff organizes all kinds of activities and events for guests. 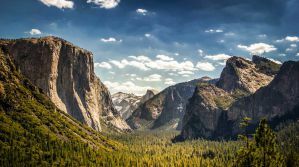 Options include hikes in Yosemite Valley, the Sequoia Groves and the High Sierra. Also nearby is the Merced River Wild and Scenic Area which is great for swimming during the summer months and rafting during the winter months. The hostel has an attached spa that has a natural spring hot tub and sauna, as well as massage treatments and yoga classes. This is a great hostel for backpackers, solo travelers and groups alike. A hostel near Yosemite National Park that's popular with solo travellers and backpackers. Yosemite International Hostel is located just minutes from Yosemite National Park. The hostel is an affordable and fun place to stay that offers all of the standard amenities including free wi-fi, laundry facilities, and a social environment. There are several common areas where guests can hang out and there's a bistro that has simple dishes and a great happy hour. The hostel also has kitchen facilities which guests can use, security lockers, bocci ball, and much more. This hostel's affordability and proximity to Yosemite National Park means it fills up quickly. Reservations well in advanced are a must, but you're sure to enjoy your time here. A hostel in Flagstaff near Grand Canyon National Park. Grand Canyon International Hostel is located in Flagstaff, Arizona and is one of the closest hostels to the Grand Canyon, which is 85 miles away from the city. It's conveniently located just a block from the Amtrak Station and is six blocks from the Greyhound Station. Nearby you'll find several good restaurants, bars, and shops. This is a great backpacker facility that has a comfortable and relaxed environment. The staff are great and the atmosphere is social. The hostel has a great television lounge where guests can hang out. They also serve a filling breakfast every morning that is free. There are both dorm and private rooms available. The dorms sleep up to four people and the private rooms have a queen bed. Every room also has it's own sink and refrigerator. This hostel offers day hiking tours to the Grand Canyon. Tours are run by knowledgeable guides and the hiking and views are quite impressive. This is an affordable and fun way to see the park. Motel DuBeau Travelers Inn and Hostel is located along the original Route 66 in Flagstaff, Arizona. It's located in the historic downtown part of the city and has easy access to several good bars, restaurants, and shops. The Grand Canyon is about 85 miles away. The hostel has all of the standard amenities including laundry facilities, kitchen facilities, a complimentary breakfast, and more. They also organize daily hiking trips to the Grand Canyon for a very reasonable price. There are both dorms and private rooms available. Every room has its own attached bathroom, comfortable beds, bed linens, and a small refrigerator. A hostel in Williams near Grand Canyon National Park. Grand Canyon Hotel Hostel is a small hostel and hotel on the famous Route 66. It has six bed co-ed dorms that have a refrigerator and simple cooking facilities. There's also free wi-fi available. There are also single and double private rooms in the hotel portion. The hostel is located in its own separate building which has all of the dorm rooms and four private rooms to choose from. The hostel is located in the historic town of Williams. Nearby you can wander around some quaint shops and restaurants and the town itself has a pleasant atmosphere. This is an affordable and charming place to stay.